Blogs is Watching - A Seattle hip-hop lifestyle blog. (SEATTLE HIP HOP): Red Bull Big Tune Producer Beat Battle TONIGHT! Red Bull Big Tune Producer Beat Battle TONIGHT! 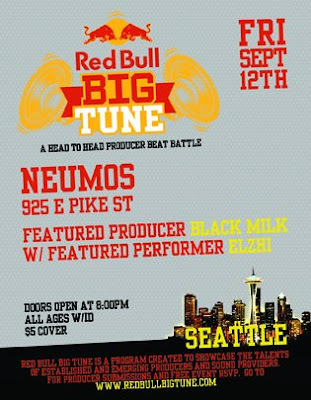 After a full week of Red Bull Big Tune week events, activities, and workshops, it all goes down at Neumos. Tonight's finale is hosted by Vitamin D and J. Moore alongside DV One on the wheels of steel as we listen to 12 producers battle it out in this competition of the Big Tune! According to this thread on 206 Proof, the following contestants are in the pool to see who represents Seattle in the national championships come December 11th, in New York "muthafcukin" city! If I'm not mistaken, the top two from each city makes it to the big apple. I'm gonna have to try and make it to NY and check it out if the scheduling works out. Cover is $5 or you still may be able to make it to www.redbullbigtune.com, click RSVP on the menu bar, and get yourself on the list for free entry into the event.